The Six Thinking Hats provides a way to look at decisions from six different perspectives. Ultimately your strategic success depends on how well you think, and the Six Thinking Hats is a tool to help you think better. 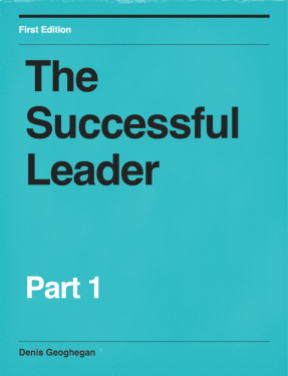 It was described by Edward de Bono in his book ‘6 Thinking Hats’. The Six Thinking Hats technique helps us to understand the full complexity of a decision and identify opportunities and threats that we might have otherwise missed. It does this by forcing us to shift from our normal way of thinking. This is important because in business successful people usually become successful by thinking in a particular way – they are usually optimistic about ideas and very logical and rational. Because of this they might not consider the decision from other perspectives such as the emotional perspective, the negative perspective, or the creative perspective. The six thinking hats applies to not just strategic decisions. It can be used in workshops, brainstorming sessions, or even by an individual working alone. Within the model each thinking hat calls for people to focus on a different style of thinking. The participants always wear the same color hat at the same time. The following six hats are identified in the model, based on the six distinct ways observed in which the human brain can think. Wearing this hat, the team must focus on the available data. Focus on what can be ascertained from the available data? What information is still missing? What steps can be actioned to fill any gaps in our knowledge? Wearing this hat, the team must focus on the problem with emotion and intuition. What does your emotion say about the decision? Try to understand how other people might respond emotionally to the decision. How will this change the way in which the decision is communicated and what actions need to be taken? Wearing the black hat, the team focuses on the bad points of the decision. Here you should aim to call out any weak points in the plan, including potential risks or difficulties. By explicitly identifying these weak points in the plan it allows you to take steps to eliminate them. By addressing weaknesses and risks the black hat perspective helps to make your plans more resilient. Wearing the yellow hat, the team focuses on thinking positively about the decision. What are the advantages of the plan? What are good aspects of the plan? What are the potential opportunities this decision creates both now and in the future? Wearing the green hat, the team focuses on thinking in a creative way. What are the possibilities that might exist out there? Can we challenge the current thinking? Note that Blue Ocean Strategy can be a useful tool here. The blue hat is only worn by the facilitator of the meeting or workshop. The blue hat wearer controls when the group changes hats. The blue hat wearer must focus on summarising the outcomes and actions from each phase of the meeting. They must also help to draw out conclusions and identify how to proceed. 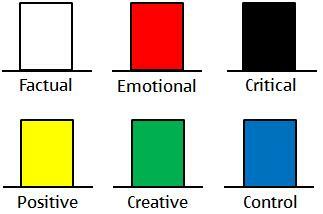 The Six Thinking Hats is a way of analysing a decision from a number of different perspectives. In business, strategic success is based on how well you can think, and the model is essentially intended to help you think better. The model can be applied at many different levels in business, including the project management and program management levels, where the Six Thinking Hats can be useful for reviewing execution plans with the team, to ensure they are solid and resilient before commencing work. For more information on the technique consider reading Edward de Bono’s book, 6 Thinking Hats.